Is It Fall Yet or What here in South Florida? With September 22nd being the first day of fall I anxiously await that first drop in humidity and hope for a cool blast. I imagine that the dead leaves on my house plants are those of fall leaves, and the winds of the passing storms along with the kids getting back to school are all indications of summers end and the first signs ofautumn. First stop is the closet to dig out that sweater or two with the excitement that I might to get to wear one of them soon! Now although we may not really get to integrate much of the fashion trends for fall for ourselves down here in the pan handle state we certainly can induce the change of seasons with some fall decorating for our homes. It truly is a favorite time of year of mine. I personally love the autumn color palette with its burnt oranges, yellows, raw and burnt sienna’s, crème brûlée, dusty purples and pops of warm olive greens. In the store we of course go crazy with it all and geared more towards Halloween. However we start with the fall palette as our base and actually integrate a lot of items right into Thanksgiving and on into Christmas décor and displays. If you start of right you can the same in your home and use the fall as a base to build upon right on into the Christmas season. Silks and artificial foliage are especially are great for this by choosing more multi seasonal items say like fall harvest sprays and picks with the ambers, browns, gold’s, warm oranges, deep reds. They work beautifully with in an arrangement of saypumpkins and acorn squash in a fall display for both Halloween and Thanksgiving. As you switch gears for Christmas simply change out the pumpkins and replace with for example some red berry sprays, snow pine branches, maybe a poinsettia pick and say a dash or two of glittered ornaments and you’re good to go. The key is selecting foliage from the beginning with a range of colors and not strong in one color for example a vibrant orange that only works for Halloween and not so much into thanksgiving. Stick with a warmer range with ambers, burnt oranges, and deep reds. Each of the colors will pop more or less depending on what you put with them. With an orange pumpkin and yellow squash the burnt oranges and golden ambers will come forward in the arrangement, when you add in the reds and gold’s for Christmas lets say those colors will come forward and the others will recede yet still end up enhancing your arrangement. 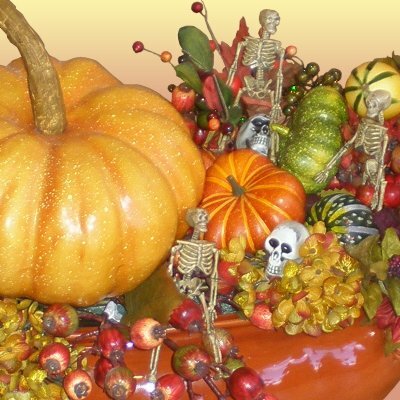 Fall foliage also easily incorporates into just about any holiday display. It can be mixed into a Christmas tree for a dash of color or simply peaking out from behind a figurine or table piece on a buffet, mantel or dining table. Get the multi uses of it rather then packing it up! Decorating for the seasons should be fun and doesn’t have to be a huge undertaking. If your dreading it, try to look at from a different perspective this year, start now and do it a little at a time, it may seem early but its really not. Its great for the mind too especially here in South Florida where don’t get to experience that incredible change of season with the changing of the leaves and so forth that naturally occurs up north. So start with a simple arrangement of fall leaves and pumpkins and say maybe a small vignette on a mantel or cocktail table and then another and so forth. Stop in to the Interior Digs N Gifts Fall Decor Shop today and visit us and we'll get you inspired with some spectacular fall decorating, holiday design trends, accessories, and more for any décor at a variety of price points to fit your budget!